We all know that the new year is time to start over and get organized, and keep those new years resolutions. I know many people make at least one resolution to get or stay organized and most January magazines have one section all about organization and cleaning. Knuff magazine holders - I love these things and they help me corral my ever expanding magazine collection (I am my own worst enemy when it comes to this, I would advise others to rip out what they love and throw the magazine away, but I just cant seem to do it myself). Anywoo, I have a ton of these painted white, added a label and stashed on the bookshelf. Airtight Glass Storage Jars - I couldn't live without these in my pantry. I think my love of jars in the pantry started from my Grandma, she always had everything in jars with neat little labels that made it so easy to find what I was looking for at her house. These airtight ones are perfect for keeping bulk items fresh. I use them for: rice, crackers, snacks, cereal, dried pasta, grains, oatmeal, and so many other items. I highly recommend them, plus they could make your plain pantry look like this. Anchor Hocking 2 Gallon Jar - Same reasons I love the airtight containers I love these ones too. I use these all over my house to store things such as: my headbands, bar soap in the linen closet, paint decks and chips in my office area, and so much more. They do sell these at Crate and Barrel, but the cheapest place to find these bad boys is Wally World. Wire Basket - I use these in my linen closet to store rolled wash clothes and rolled hand towels. They make my linen closet so pretty to look at. Plastic Shoe Box - I know I have posted about these before but I love them that much. They are a whopping $1.89 each and if you by a box of 20, they are only $1.69 each. I probably have a total of 50 of these babies in my apartment and they are a storage lifesaver! Not only do I use them in my closet to store off season shoes, but I use them in my linen closet to store meds, first aid supplies, extra toothbrushes and toothpaste, my overflow of makeup, and other odds and ends. They stack neatly and in only 6 boxes I can store an entire 3 shelves worth of items. Large basket - I've also blogged about this basket before too. Its large, sturdy and holds ALOT. From throw blankets to wood for the fire these are so useful. Wine Box- One free item on the list, woohoo! Head to your local Trader Joes or liquor store and ask if they have any wood wine crates they are looking to get rid of. I use two of these on top of bookcases to store school books and binders full of class notes that I just cant throw away. I actually have used them alot and am so glad I didn't toss them. Tray- Clearly I have an obsession with trays and boxes as I have blogged about them over and over on this blog (here, here and here). Trays are a major organizational tool in my apartment and I love how they make messy areas neat looking. All 8 of these items help organize and keep my small apartment neat. I don't know what I would do without any of them. Even if organizing seems like a huge project, try tackling just one closet in your house at a time. I promise with some $1.89 boxes you can give it an overhaul in no time. Come back tomorrow to see 3 labeling items that I also couldn't live without. They go hand in hand with these containers and take organizing to the next level. I am knee-deep in donation piles in hopes of resetting my organization at the start of the year. 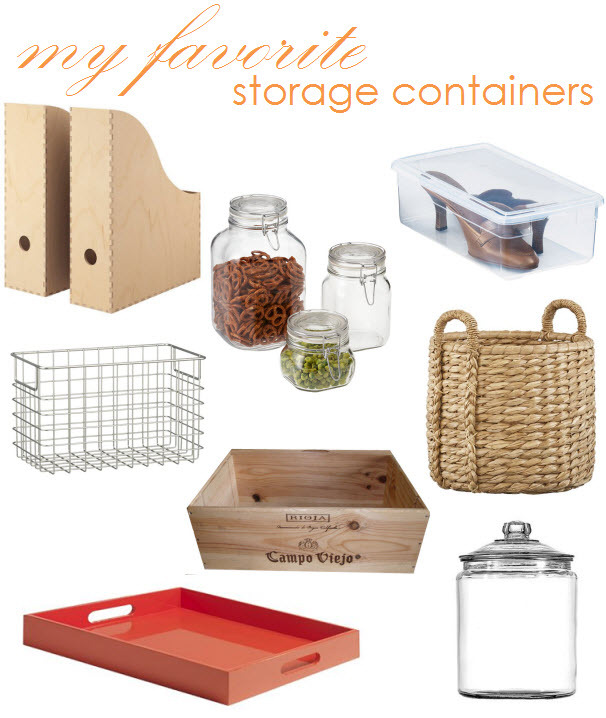 I'll definitely be stopping by The Container Store for items like these! P.S. Welcome back and happy new year! Great post and thanks for the resources! I'm going to have to order some of those shoe boxes. I've got lots of organizing to do! I *love* those plastic shoe boxes - we have loads of them at our house and only a few are actually used for shoes! Love your fave containers. Totally agree about those shoe boxes: they are inexpensive and multifunctional. Have a great year. I am all over those little shoe boxes and cannot believe the price. We picked up the glass canisters yesterday at Walmart and yes, they have the best price around. What a great roundup! My favorite is definitely the clear shoe boxes. Happy New Year! I'm flipping over the wine box you've featured... I wouldn't have thought to ask at TJ's or our local wine shop, but I would LOVE to use something like that in our house. Bonus points for recycling. I'll let you know how it goes! This is just what I needed..thanks. Seriously what a great round-up. I so needed the rec. for the IKEA magazine holders! Never seen those before, and always looking. Happy New Year! i just did a major pantry overhaul and transferred a lot of stuff to glass jars...makes me so happy every day to look at them! i love how small changes can have such a big impact.